Masked Intruder has a new EP, Love and Other Crimes, that was released on July 8. 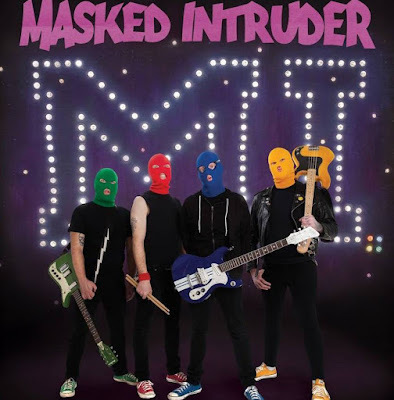 Masked Intruder is a pop punk band from Madison, Wisconsin. The members of the band are Intruder Yellow (Jason), Intruder Green (Jake), Intruder Red (Andy) and Intruder Blue (Patt). They are a gimmick band who wear colored ski masks on stage and in their publicity photos and never reveal their faces or identities. Intruder Blue and Intruder Green claim to have met and formed the band while in jail. Their self-titled debut album was released by Red Scare in 2012 and then re-released by Fat Wreck Chords in 2013. Their song "Heart Shaped Guitar" is a duet with Maura Weaver of the band Mixtapes, who is also referred to as Intruder Pink. Before playing as Masked Intruder all 4 band members were part of The Gusto. Give them a listen. Do you have a favorite?